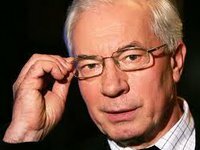 European politicians have real levers of pressure on the Ukrainian opposition to stabilize the situation in the country, Ukrainian Prime Minister Mykola Azarov said. "European politicians could give Ukraine real help in stabilizing the situation. It would be enough if [European Commission President Jose] Barroso, [EU High Representative for Foreign Affairs and Security Policy Catherine] Ashton, [European Commissioner for Enlargement and European Neighborhood Policy Stefan] Fule or other European politicians addressed the Ukrainian opposition and said that the seizure of state organizations and administrative buildings is illegal and contradicts the standards of democracy. And if you pursue such actions, we will not cooperate with you," the Ukrainian prime minister said in Davos in an interview with RBK, which was posted on the website of the Ukrainian government.